While living life to the fullest is something we all aim to do, a medical condition, illness, or unexpected injury may make you realize you could use some assistance at home. If you’ve noticed you’re spending extra time with daily activities, then home health care may be the perfect solution to help you live each day to its greatest potential. While the decision to utilize home health care is easy, you may be wondering how to choose a home health care provider. With a growing market of providers, it can be difficult to find the right match for you. Whether you’re looking at potential home health care providers for yourself or for a loved one, you’ll want to keep in mind what is most important: the needs of the person who will be receiving care. Establish what kinds of services you or your loved one will require. While some people simply need a little extra help with personal care and household upkeep, others require more extensive support and require the expertise of a medical professional. To get started, make a list of the kinds of care you need or would like to receive – perhaps with the help of your doctor. What services does each home health care provider offer? Once you know your own needs, you can explore different home health care providers to see what types of services each provides. Refer back to your list of needs, and check that your potential provider offers the services you are looking for. While some providers employ a staff of medical professionals who can help with administering medications, injections, and other substantial medical care, others may not. Be sure your home health care provider checks off the requirements on your list to ensure your needs will be met. What are the home health care provider’s credentials? What services does Phoenix offer in Topeka? To qualify for Medicare or Medicaid home health services, your home health agency must be Medicare and/or Medicaid certified. Phoenix Home Care meets this requirement. 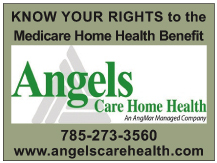 Home health care services are covered under Medicare Part A or Part B. Once you understand how to find a home health care provider and begin exploring your options, check out what Phoenix Home Care has to offer. We provide many home health services, including those that require the assistance of a medical professional, and we are committed to improving the quality of life of each of our clients. Our dedicated staff would love to help you get back to living the fullest life possible. If you have questions, call 785-260-6444 to speak with one of our friendly team members, and you will soon be on the journey to a happier, healthier you!